Lincoln Center, the World’s leading performing arts center is located in the heart of New York City on a 16-acre campus, it houses 11 prestigious cultural organizations including the Chamber Music Society of Lincoln Center, the Film Society of Lincoln Center, Jazz at Lincoln Center, The Julliard School, Lincoln Center Theater, the Metropolitan Opera, the New York City Ballet, the New York Philharmonic, the New York Public Library for the Performing Arts, the School of American Ballet, and Lincoln Center itself. Paving the way to world class performance since 1962, Lincoln Center invites art savants and newcomers alike to see what it feels like to let art in. Lincoln Center employs some 9,000 full-time, part-time, and contract workers. Each year, Lincoln Center welcomes 5 million visitors, 3.6 million performance attendees, and thousands of artists—and can seat 26,543 audience members at one time. Renowned for an eclectic mix of thousands of events held annually and a groundswell of creative energy all throughout the masterfully designed campus, you could come every day of the year and still only scratch the surface. The city’s most legendary apartment building, the Dakota built in 1884, towered over the Upper West Side and was an immediate success with all its apartments rented on opening day. Designed by Henry J. Hardenbergh, who would later design the Plaza Hotel, the building had tennis courts and a croquet field on the adjoining 175-foot-long lot on West 72nd Street that was later developed after World War II as a separate apartment building. Because elevators were quite new at the time and as was the concept of apartment living for the well-to-do, the eighth and ninth floors of the building were originally used for servants’ quarters and laundry. Many of residents of its cooperative apartments have been celebrities including Leonard Bernstein, the composer and conductor, Lauren Bacall, the actress, Judy Garland, the singer, William Inge, the playwright, Jo Mielziner, the stage designer, Rex Reed, the columnist. John Lennon was it’s most famous resident, he was slain on 8th December 1980 by Mark Chapman. Yoko Ono continues to live in apartment No. 72 and has another apartment just for her furs and memorabilia. On July 21, 1853, the New York State Legislature enacted into law the setting aside of more than 750 acres of land central to Manhattan Island to create America’s first major landscaped public park; they would soon refer to it as “the Central Park.” Advocates of creating the park–primarily wealthy merchants and landowners–admired the public grounds of London and Paris and urged that New York needed a comparable facility to establish its international reputation. Frederick Law Olmsted and Calvert Vaux, the winners of the 1858 design competition for Central Park, along with other socially conscious reformers understood that the creation of a great public park would improve public health and contribute greatly to the formation of a civil society as well as offer families an attractive setting for carriage rides and provide working-class New Yorkers with a healthy alternative to the saloon. Today Central Park has never been more beautiful or better managed in the Park’s 156-year history, and the Conservancy is proud to be the leader of the Park’s longest period of sustained health and beauty. Strawberry Fields is a living memorial to the world-famous singer, songwriter and peace activist, John Lennon. During his career with the Beatles and in his solo work, Lennon’s music gave hope and inspiration for world peace and his memory and mission lives on in Strawberry Fields. This tranquil section of Central Park was named after one of Lennon’s favorite songs, “Strawberry Fields Forever.” The mosaic was created by Italian craftsmen and given as a gift by the city of Naples., it bears the word of another of Lennon’s songs: Imagine. Strawberry Fields was officially dedicated on October 9, 1985, the 45th anniversary of Lennon’s birth. Lennon’s widow, Yoko Ono Lennon, worked with landscape architect Bruce Kelly and Central Park Conservancy to create a meditative spot. A designated Quiet Zone in the Park, the memorial is shaded by stately American elms and lined with benches. In the warmer months, flowers bloom all around the area. Along the path near the mosaic, you’ll find a bronze plaque that lists the 121 countries that endorse Strawberry Fields as a Garden of Peace. The Museum Mile is a stretch along 5th Avenue full of museums and other fine arts institutions in Manhattan. If you are in New York for a short stay and need to cram in lots of sightseeing, Museum Mile is a must. The tree lined walk down the side of Central Park is a beautiful way to check out the numerous museums in this stretch which include but not limited to; El Museo del Barrio at 104th Street, Museum of the City of New York at 103rd Street, Jewish Museum at 92nd Street, Cooper-Hewitt National Museum of Design at 91st Street, National Academy Museum and School of Fine Arts at 89th Street, Solomon R. Guggenheim Museum at 88th Street, Metropolitan Museum of Art from 82nd to 86th Streets, and Goethe House German Cultural Center at 82nd Street. Fifth Avenue spreads along 5 miles of the most valuable real-estate in Manhattan: 102 streets (8th street to 110th street.) It’s a magnet for the rich & famous, who come from all around the globe to live, work, and play here. For over 150 years, Fifth Avenue has hosted many studios and laboratories where artists, scientists and inventors (including Tesla) have made it the place to be for both industry and art. Rockefeller Center and the Empire State Building, two of the highest and most famous buildings, make Fifth Avenue home to 2 out of 3 observatories in New York State. There are famous churches and so much to see. St. Patrick’s Cathedral was built in the democratic spirit, paid for not only by the contributions of thousands of poor immigrants as well as prominent citizens. The construction of St. Patrick’s Cathedral began in 1858 and opened its doors in 1879. This international landmark is a beacon of hope for those who share the Catholic faith and a source of inspiration to the more than five million visitors of every religious denomination welcomed here each year. No single generation builds a cathedral. The vibrancy of its windows, the beauty of its music and the purpose of its charitable outreach call us to respond to our shared humanity. Although John D. Rockefeller Jr. spent most of his life engaged in philanthropy, his single, defining business venture was the creation of the “city within a city”. Constructed during the Great Depression’s worst years, the project gainfully employed over 40,000 people. When Rockefeller Center officially opened in May 1933 30 Rockefeller Plaza boasted a grand lobby decorated by accomplished European artists, Frank Brangwyn and José Maria Sert. Throughout the 1930s, Rockefeller Center steadily improved, including some accidental innovations like the Christmas Tree tradition in 1931 and the skating rink in 1936. By 1939, more than 125,000 people were visiting Rockefeller Center daily; on its own, it would have been the 51st largest city in the U.S. Today at this “city within a city” there are many ways and things to do while visiting, one things including Top of the Rock. From the floor see breathe taking views of Manhattan and the surrounding city, plus perfect views of the Empire State Building and the World Trade Center. NBC- Rockefeller Center is also home to the headquarters of the NBC Network as well as stage to the Today Show and Saturday Night Live. When the stock market crashed in 1929, John D. Rockefeller, Jr. held a $91 million, 24-year lease on a piece of midtown Manhattan property properly known as “the speakeasy belt.” The plan was to gentrify the neighborhood by building a new Metropolitan Opera House on the site. Bryant Park is a privately managed public park located in the New York City borough of Manhattan. It is located between Fifth and Sixth Avenues and between 40th and 42nd Streets in Midtown Manhattan. Although technically the Main Branch of the New York Public Library is located within the park, effectively it forms the park’s functional eastern boundary, making Sixth Avenue the park’s primary entrance. Bryant Park is located entirely over an underground structure that houses the library’s stacks, which were built in the 1980s when the park was closed to the public and excavated; the new library facilities were built below ground level while the park was restored above it. “The site chosen for the home of the new Public Library was the Croton Reservoir, a popular strolling place that occupied a two-block section of Fifth Avenue between 40th and 42nd Streets. Dr. John Shaw Billings, one of the most brilliant librarians of his day, was named director. Madison Square Park has existed as an urban public space since 1686. Named for James Madison, fourth President of the United States, Madison Square was formally opened as a public park in 1847. It was the birthplace of Baseball and was also called home in the beginning of 1876 for the arm and torch of the Statue of Liberty for six years to raise funds for construction of the statue and base. Trinity Church, at 75 Broadway in Lower Manhattan, is a historic, active, well-endowed parish church in the Episcopal Diocese of New York. Trinity Church is near the intersection of Wall Street and Broadway. The Financial District, also commonly referred to as FiDi, is a neighborhood located at the southern tip of of Manhattan which comprises the offices and headquarters of many of the city’s major financial institutions, including the New York Stock Exchange and the Federal Reserve Bank of New York. Anchored by Wall Street in the Financial District, New York City has been called both the most economically powerful city and the leading financial center of the world, and the New York Stock Exchange is the world’s largest stock exchange by total market capitalization. Several other major exchanges have or had headquarters in the Financial District, including the New York Mercantile Exchange, NASDAQ, the New York Board of Trade, and the former American Stock Exchange. Wall Street is a 0.7-mile-long street running eight blocks, roughly northwest to southeast, from Broadway to South Street on the East River in the Financial District of Lower Manhattan. Over time, the term has become a metonym for the financial markets of the United States as a whole, the American financial sector (even if financial firms are not physically located there), or signifying New York-based financial interests. Charging Bull, which is sometimes referred to as the Wall Street Bull or the Bowling Green Bull, is a bronze sculpture, originally guerilla art, by Arturo Di Modica that stands in the Financial District in Lower Manhattan. Visit and rub the Bull or good luck and future wealth. Brookfield Place, originally known as the World Financial Center, is located across from the World Trade Center and overlooks the Hudson River. It has been home to offices of various companies including Merrill Lynch, RBC Capital Markets, Nomura Group, American Express and Brookfield Asset Management, among others. In 2014, the complex was given its current name following the completion of extensive renovations. Today this beautiful complex is home to several high end stores in their shopping center, various delicious big name food venders in their food area and an indoor area called their “Winter Garden,” a great place to relax all year around under gorgeous palm trees or Christmas trees in winter. Brook Filed Place hosts many art installations, events in their marina and every winter a fun and exciting ice rink for all to enjoy. “Honoring the lives of those who were lost is at the heart of our mission. Occupying eight of the 16 acres at the World Trade Center, the Memorial is a tribute to the past and a place of hope for the future.” (9/11 Memorial) One this site today can be found two reflection pools sit to represent the location of each of the towers. “Standing as a shining beacon for the new Downtown, and a bold addition the skyline, One World Trade Center is safe, sustainable, and artistically dynamic. Soaring to a symbolic 1,776 feet — it is the Western Hemisphere’s tallest building, and already an iconic New York landmark.” (WTC) OWTC opened its doors in October 2014; it has 104 floors, 54 high speed elevators, a 55 foot high lobby ceiling and houses 3 million square feet of rentable space. Since May of 2015, at the top of the WTC one can now see beautiful 360 degree views of NYC it is famous observatory. Facing the New York Harbor and the Statue of Liberty Battery Park is a 25-acre public park located at the southern tip of Manhattan. The area and park are named for the artillery batteries that were positioned there in the city’s early years to protect the settlement behind them. (wiki) Here you can visit a variety of monuments, meet the ferry for the Statue of Liberty, take beautiful walks along the water and visit few different museums along its path. The island was called Minnehanonck by the Lenape and Varkens Eylandt by New Netherlanders, and during the colonial era and later as Blackwell‘s Island. It was known as Welfare Island when it was used principally for hospitals, from 1921 to 1973. It was renamed Roosevelt Island in 1973 (wiki). While the bridge to Roosevelt Island was under construction the tram was build as an alternative. However it became part of everyday life of commuters and one of the NYC treasures. Making it the only aerial commuter in the entire country. Coney Island was originally part of the colonial town of Gravesend. By the mid-19th century, it became a seaside resort, and by the late 19th century, amusement parks were also built at the location. The attractions reached a historical peak during the first half of the 20th century, declining in popularity after World War II and following years of neglect. 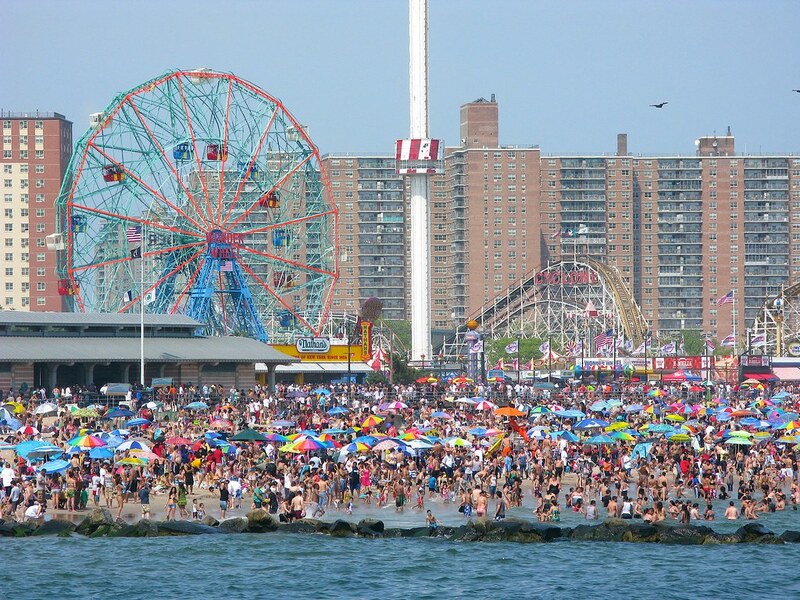 The area was revitalized with the opening of the MCU Park in 2001 and several amusement rides in the 2010s(wiki). It also has New York Aquarium with famous Nathan’s hot dog stance. Located near the Prospect Heights, Crown Heights, Flatbush, and Park Slope neighborhoods of Brooklyn and founded in 1895, the Beaux-Arts building, designed by McKim, Mead and White, was planned to be the largest art museum in the world. The museum initially struggled to maintain its building and collection, only to be revitalized in the late 20th century, thanks to major renovations. Significant areas of the collection include antiquities, specifically their collection of Egyptian antiquities spanning over 3,000 years. European, African, Oceanic, and Japanese art make for notable antiquities collections as well. American art is heavily represented, starting at the Colonial period. Artists represented in the collection include Mark Rothko, Edward Hopper, Norman Rockwell, Winslow Homer, Edgar Degas, Georgia O’Keeffe, and Max Weber. The museum also has a “Memorial Sculpture Garden” which features salvaged architectural elements from throughout New York City (wiki). It also has Brooklyn Botanic Garden next to it.